The pinnacle of rugby league in Australia, the Queensland v New South Wales state-of-origin series, will be decided next week in the native AFL code’s heartland of Melbourne. New South Wales will be coached by Graham Murray, a man who had to enter the deep north of Queensland as chief tactician for the Townsville-based Cowboys club, before earning the right to take the reigns of his home state’s side. The Queenslanders will be led by imposing former player, Mal Meninga, who spent the best part of his rugby career ensconced in Canberra with the Raiders club. So revered was he in the nation’s capital, his foreshadowed tilt at politics in the ACT's Legislative Assembly was set for success, until he pulled out in the midst of a media interview. The beauty of origin football is that it allows these geographical blips in a person’s career to be conveniently set aside and for the player to be remembered for their finest moments in the code. The considerable downside, as manifested by the “retirement” of the concept of origin football in Australian Rules, is that when married with a prominent and fluid national club competition, the tribal significance of the concept becomes diluted. Despite recent chatter by opinion shapers within the AFL fraternity, origin football is a long way off any re-introduction, let alone elevation to something other than a quirky sideshow or pre-season tournament. In rugby league where it has had nearly three decades of sustained success, the cracks in the series are apparent for those bothering to look behind the hyperbole produced by the media and administrators (both guided by vested interests) to dissect what is going on. To understand why the origin series has been the showpiece of rugby league since its introduction in 1980, one must appreciate Queensland’s obsession with beating New South Wales. Queensland-based rugby league historian, Dr Greg Mallory, argues that this attitude is partially derived from the northern state’s response to the “stealing” of local players by poker-machine rich Sydney clubs from the 1950s onwards which saw some of Queensland’s best players thriving in blue jerseys. Juxtaposed by the sunshine state’s well-illustrated social parochialism, the tribal die was cast. My support for the Maroons was born in the pre-origin days of the 1970s. 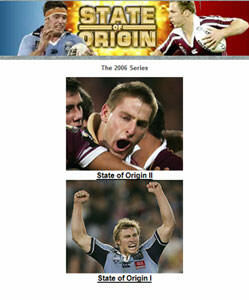 Despite the Queenslanders’ obvious passion and spirit, our skill levels and professionalism were below par. To get within a handful of points of the southerners was a major achievement in any game. Queensland failed to win a series in the 1970s; the decade saw them win just two, and draw two, from 29 matches. A 14-13 loss at Lang Park in 1977 for me still ranks as my favourite interstate encounter, when – despite leading for most of the match (a rare experience) – the superior fitness level of the Blues overpowered us in the dying minutes. The return of players to Queensland such as Arthur Beetson and Kerry Boustead and the emergence of a quite remarkable stable of home grown talent in Meninga, Gene Miles and the mercurial Wally Lewis, laid the foundation for Queensland to dominate origin clashes in the 1980s and to remain competitive in the 1990s. However, the widespread exposure through pay television of the National Rugby League (formed at the closure of the Super League war in 1998) and the pitching of Queensland-based NRL clubs in virtual origin clashes most weeks against Sydney teams, has eroded the emotional capital in rugby league’s origin franchise. History shows that in the evolution of Australian sport, once the tribal factor has been removed or significantly reduced, the sport or concept is vulnerable to alternatives. Cricket administrators had to quickly back track when in the 1994-95 one day international cricket series, they introduced an Australia A team in direct competition to the national side to improve the appeal of a lack lustre international program. The experiment was short-lived when the two met in the finals series and Aussie cricket fans were divided in their loyalties, with more backing the underdog “A” side. In spite of the cracks, next week’s match is certain to be a television ratings winner in the eastern states, and will sell out at Docklands. And, despite my grim concerns for the future of origin, I will be there in the throng of supporters with my eight year-old son, cheering fervently for a Queensland victory and trying mightily to instil in his young mind the passion I felt three decades earlier. However, unless tribalism is revitalised in rugby league, I can’t see how his generation will persist with the concept. That is a very ugly picture of me. Mr Howard has travelled to Indonesia to mend the rift in relations betwen the two countries. Critics of the proposed legislation designed to appease Indonesia, fear that Australia is in serious danger of surrendering its sovereignty by allowing another country to force its hand on policy matters, such as migration.